The first chapter talks about the piccolo trumpets that I bought. This list will therefore be a subjective one, but it will be based on a concrete experience. All along my publications dedicated to the piccolo trumpet (see the Books and Methods section), I have explained many points that will be only briefly covered in this webpage. 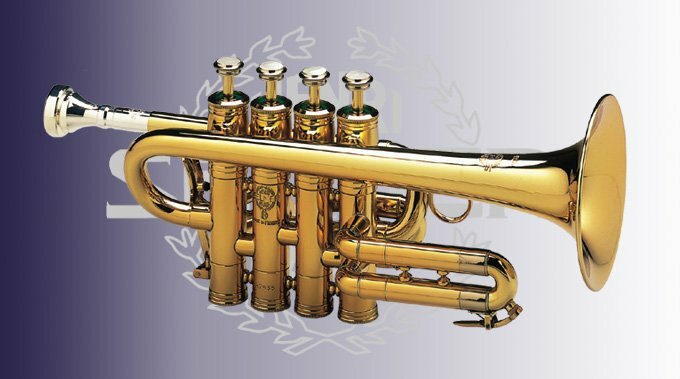 The second chapter will be devoted to almost all the piccolo trumpet models available in the world. At the end, I talk about the low priced piccolo trumpet models.
" 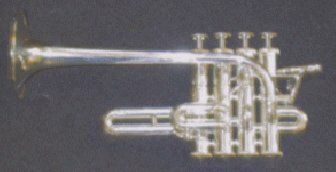 A piccolo trumpet has 4 valves, not 3 *. The fourth valve allows low notes and very important alternate fingerings. 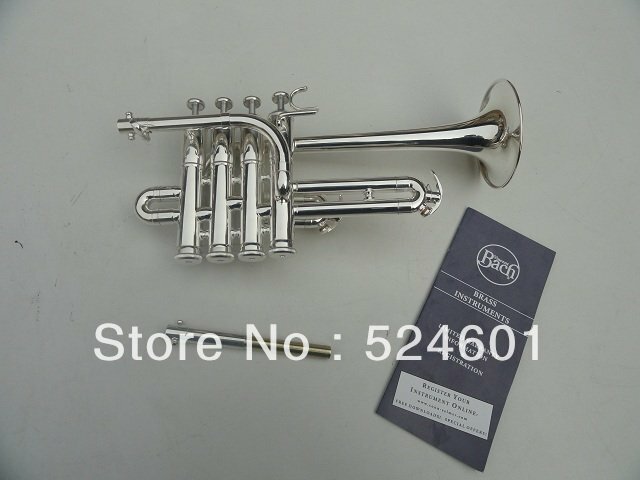 You have to buy a piccolo trumpet that has a tuning system on the third valve slide, like every big trumpet has. Without this tuning system (ring or trigger), you cannot play in tune. This 3rd slide must be perfectly easy-going, it is an important point (perfect adjustment). The short models have an amazing projection, by far superior to the long (developed) models." *Nota : Selmer made a piccolo trumpet with 3 valves in 1959. Maurice André asked for a 4th valve which appeared in 1967. Andre at once saw the limits of Adolf Scherbaum's instrument (see The piccolo section) and asked for this 4th valve (and a 3rd slide tuning system). He then used this ideal instrument in his entire career. 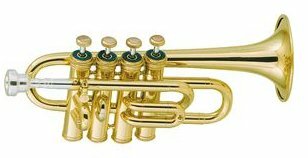 I wonder why, in 2008, some manufacturers still keep making 3 valve piccolo trumpets ? 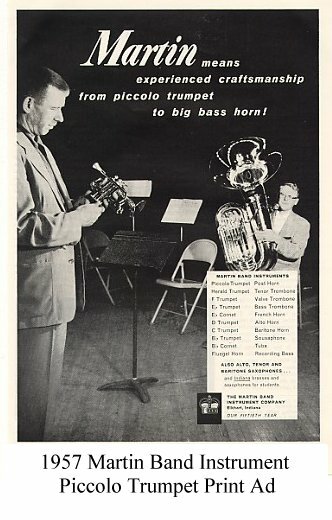 The great reference in the piccolo trumpet history. This model, made in the late 60s' by Selmer was played almost exclusively by Maurice André in his career. I have owned 7 different models of this type and none has turned bad : ideal projection, always in tune, perfectly centered, great ergonomics. 2 years ago, Selmer completely stopped trumpet manufacturing in France. The Selmer 59BLF (or the 465 - see below) is a very good instrument that does not reach at the perfection of the 1967 version. The 59BLF tuning is perfect. We can note the very efficient trigger, braced on the first valve casing. A beautiful piccolo with an excellent projection... 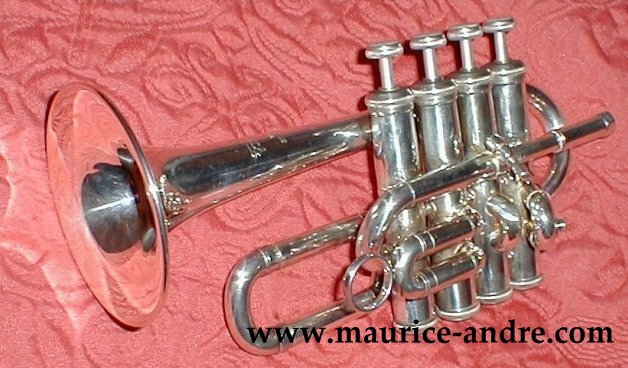 The great "French sound"piccolo trumpet. I remember the first time I put this Bach 196 in Maurice André's hands I had just received, a brand new, from my friend Rudi Stuber, physicist at the UCSB . Maurice did not know this model at all and, an at once, he checked the adjustment of the 3rd slide. This is a good piccolo trumpet, a bit heavy with bad ergonomics. Sound and projection are superb. The 3rd slide works absolutely great. No water key, which is a big, big mistake for a high priced instrument. The new VBS196 is a long model : projection will definitely not be the same. Kanstul (Anaheim) makes the smoothest valve mechanics that I have ever seen in the USA or at the Frankfurt Music Fair. Unfortunately, projection is not good. This ATR 383 comes from Amati Kraslice (Ceverny). Czech company. It has awful adjustments of the valves. Trigger with 2 water keys. Good sound and tuning for this Spanish model, more or less a copy of the P5.4. Projection is good, no more. Maurice said in May 2008 : " I've been disappointed by the attitude of Stomvi that I helped to launch, 15 years ago." It looks like Stomvi is now more interested in little gadgets than in sound paramaters. It is a very light piccolo (Beryllium). Jim Donaldson wrote that it is the benchmark of all piccolo trumpets. I do not think that at all. To me, it is almost a perfect model in a technical sense, but the sound is definitely not good. When I met Wynton Marsalis at the Vienne Jazz Festival, we spoke about his piccolo trumpet album "In Gabriel's garden" for which he obviously used the P5.4 with 4 different mouthpieces. He was very happy to tell me about that detail, regarding the 4 mouthpieces. 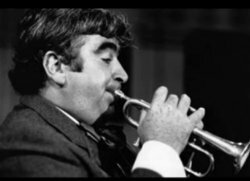 Then I spoke about the little Selmer of Maurice and Wynton agreed that the French master has an unequaled superiority, when sound is concerned. I never played the P 7-4 which is a much more interesting model. The poorest piccolo trumpets in the world. All are out of tune. This is a real catastrophe of a trumpet. 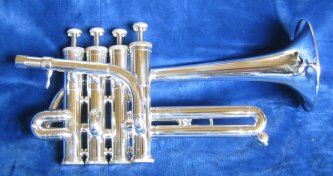 "Zeus Erato" piccolo trumpet (Zachary/Canada). A very interesting piccolo with great projection. Valve mechanic is also at the top. Valve casing is too high and poor water key (Amado, again). See the peculiar way for air between valve casings. It is a direct air column as we can find on old Courtois models, for example. Amazing result. I like this piccolo very much. 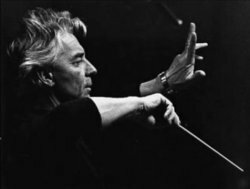 My friend Bernard Soustrot was technical advisor for Couesnon, as Maurice was for Selmer. 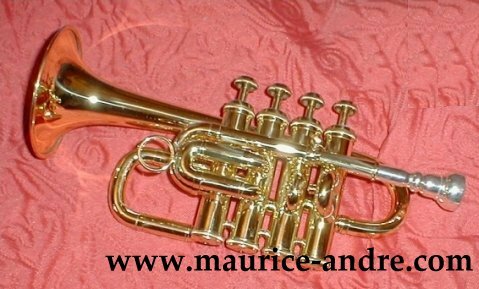 Couesnon made fantastic piccolo trumpets but the last 10 years, all models have disappeared from the Chateau-Thierry workshop. 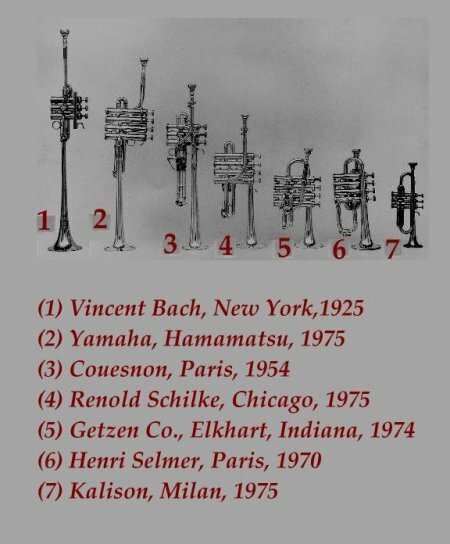 I owned 5 models as shown on the photo, and 2 with only 3 valves. The best projection I have ever experienced on a piccolo trumpet. Bad ergonomics, uneasy use of the 3rd slide ring, no water key...but what a sound ! This is due to the bore and the unique shape of this bell. Played by my friend Guy Touvron, this Selmer 465 BLF/S has a superb sound. The length of this piccolo is equal to a big trumpet (this is why the bell is removable). Excellent trigger, as on the 365. 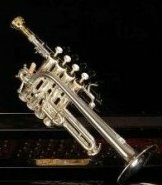 To me, by this excessive length, we're much too far from the "little trumpet" (la petite trompette - as musicians said in the 30s') ideal...Too far from the real spirit of the piccolo trumpet. I once played, at the Frankfurt Music Fair, the Prana Monette and the piccolo Adaci. because no serious piccolo player will play only on a Bb or only in an A piccolo... Valve mechanism is inferior to a Kanstul and sound inferior to a 365 Selmer. But price is superior to both. 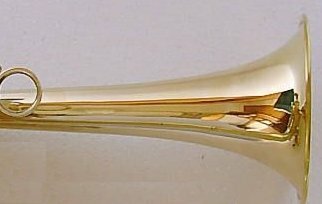 A VIP piccolo trumpet. I do not know one single recording made by Wynton on a Prana piccolo. He always used the P5-4. -Romeo Adaci (Germany). His style is very close to Monette. Same VIP-trumpet philosophy. With Amado water keys ! Sound is between a P5-4 and a Stomvi Master. Price is by far beyond. 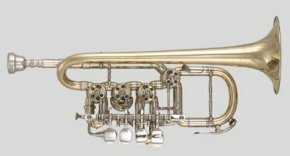 On the Getzen and Benge models, for example the Getzen Eterna and the Benge 4P, no tuning system for the 3rd valve, which is absurd. 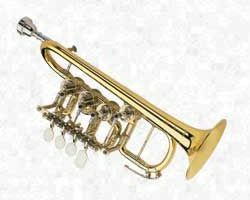 The EM Winston piccolo trumpet looks like an Amati with the same defaults...And still without water key. 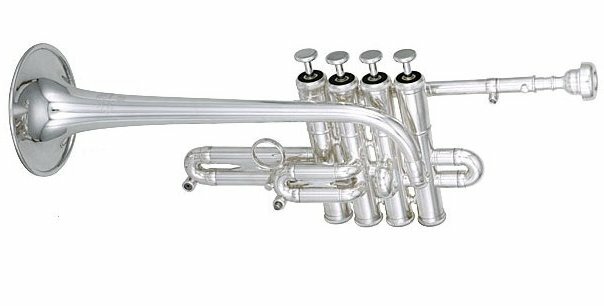 I do not like Yamaha piccolo trumpet models that are, more or less, copies. On the expensive YTR9830 there is no 3rd slide tuning. Sound is extremely brilliant and too aggressive for me. A perfect copy of the Yamaha YTR9820c is made by JINBAO, Tianjin (China). Jinbao piccolo tpt - 3v. Great piccolo tpt by Roy Lawler (Decatur, Tennesse - as Blackburn). An instrument definitely interesting, las , with only 3 valves. Amado key was not necessary. I definitely wait for the 4th valve model. Everybody knows the high quality of Swiss wind instruments. I think about Antoine Spada, whose workshop is in Burgdorf or to my friend Karl Burri, from Zimmerwald. Antoine Spada - Original 3d slide tuning - Amado water key. An interesting model but very expensive. Unfortunately, no aesthetic at all. In Winterthur, Werner Spiri made a real interesting piccolo trumpet model. The 3rd slide tuning is well-thought. Pity we again find those Amado water keys. Spiri piccolo trumpet seems to be a great instrument. A great piccolo by the Egger worskshop, Basel, Switzerland. Pity they put those Amado. 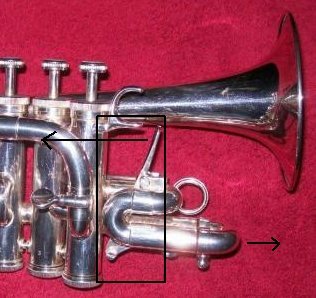 The Denis Wedgwood piccolo trumpet (UK) seems not ot have any 3rd slide tuning ring or trigger, it is a most problematic statement for a handcrafted instrument. 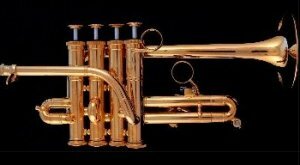 Last, Leblanc (division of Selmer/Conn) made a piccolo trumpet "Sandoval" which is a copy and does not offer anything new, for this price. No 3rd slide tuning but 2 water keys ! The same defaults for their short bell model. The Leblanc T351 standard model shows a really bad finish. Still no tuning system for the 3rd slide but an Amado water key. No quality at all ! 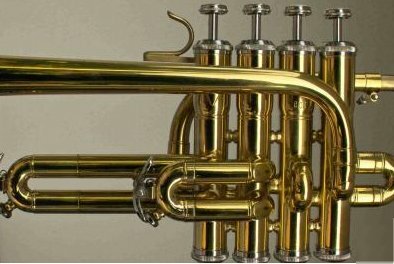 Weril ET9080 - Brasil - I did not play this model but only Weril big trumpets, which are absolutely awful. Thein - Bremen, Germany. A complete instrument, a priori well-thought...Very poor design. Besson 60MP Meha piccolo - A long model with R.O. Schilke type bell. Valve casings are too high, yet, we have here a real piccolo trumpet. 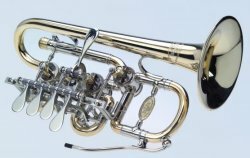 MTP piccolo trumpet sold by Abenheimer Musikladen - Worms-Abenheim (Germany). Probably a Chinese instrument. Amrein (Lübeck, Germany) ATR P-8401. CHINA. Michael Kordick Piccolo - Riedlhütte, Germany. Funny intake air leadpipe, no 3rd slide tuning, high valve casing, Amado keys...! A great instrument handmade by Bernhard Bross - Offenburg-Elgersweier (Germany). 3rd valve tuning system. Unique curve for the leadpipe and the bell. Van Cleave piccolo tpt. Without 3rd slide tuning and without water key. CHINA. Piccolo Possegger - Austria, Dellach am Millstätter See. Intake air leadpipe to low, very high valve casings, Amado water keys. Crude model. 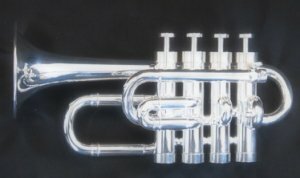 Kröger piccolo trumpet (Trier, Germany). A perfectly well-thought model. High quality instrument. Efficient 3rd slide tuning system, as on the Spada. Another high quality instrument from the worskhop of Hans Kromat, in Wilstedt, Germany. Great work. Blackburn piccolo tpt - USA, Decatur (Tennessee). No 3rd slide tuning. Amado keys. Blackburn is renowned for their special piccolo tpt leadpipes (without big effect, by the way). This piccolo is much too expensive for its finish. Fides-Beck workshop (Dettingen, Germany). Great instrument, great sound. High price. A great piccolo trumpet ("Eclipse") by Schagerl, in Mank (Austria). Despite the Amado keys, a real handcrafted piccolo trumpet. 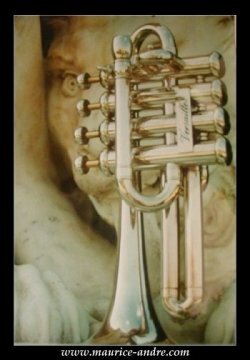 The beautiful "Tristan" piccolo trumpet, also by Schagerl. Perinet system. 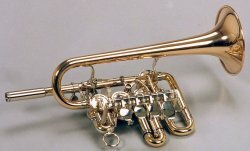 Piccolo trumpet by Gottfried Büchel (Bonn, Germany). 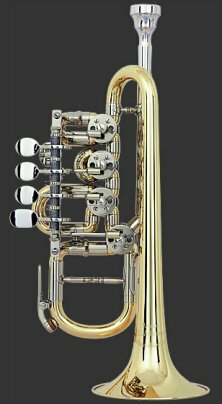 Courtois Paris TR 122 piccolo trumpet. We knew the old short model with exchangeable bell which was definitely great by sound and finish. Here is the long one. Apparently perfect in its conception but quality seems not soo high as the old model. Note : Courtois formerly made also a short model for Leblanc. Note the 4th slide in a most unique position. No tuning system. An instrument by Kühnl & Hoyer from Markt Erlbach (Germany). 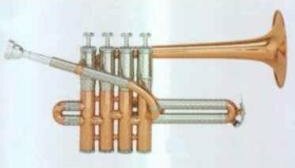 It is a real pity that almost every piccolo trumpet models are now inspired from the Schilke 1971 aesthetic, with a long bell. The rotary piccolo trumpets are mainly played in Germany and Austria. 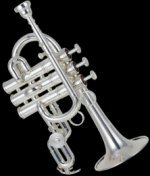 In addition to Scherzer, we can also find a great deal of high-quality handcrafted piccolo trumpets. 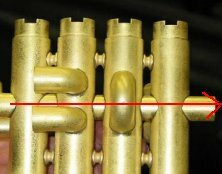 The rotative system is very special and for those who are used to play the perinet system (cylinder valves) it is very difficult to play these instruments. The rotary mechanics can often be the same because some manufacturers are specialized in that, such as the Glas brothers or Hubert Kain manufactures. 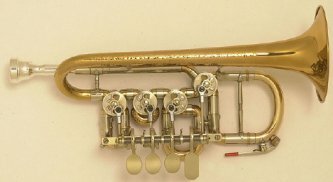 Berndt C. Meyer piccolo trumpet, Dresden (Germany). Handcrafted instrument. 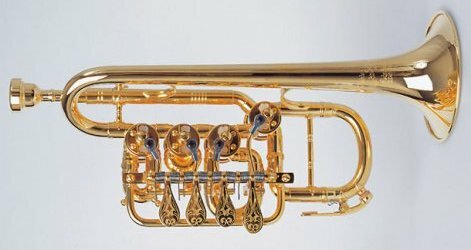 Finke piccolo trumpet - Germany (not far from Dortmund) - long model, close to Scherbaum instrument's spirit. 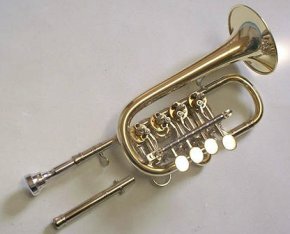 Haagston piccolo trumpet - Austria (Stadt Haag) - Beautiful finition. (made for Josef Rast) which can play an octave lower. Martin Lechner piccolo trumpet, handcrafted in Bischofshofen, Austria. Also available in with valves (perinet) upon request. Another gorgeous model by Martin Schmidt workshop, in Postdam. By Herbert Laetzsch , Bremen. Handcrafted piccolo trumept by Martin Peter - Markneukirchen (Germany). Ricco Kühn, Oederan in Germany. New rotative system. Large bell. Superb instrument. 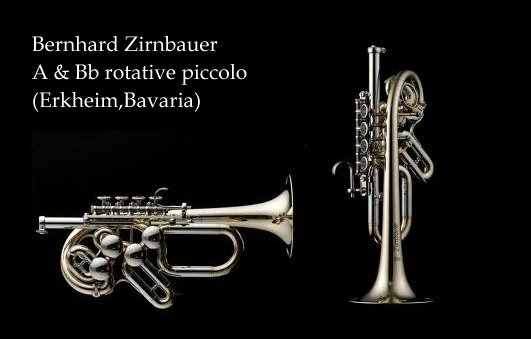 Some german rotative piccolo trumpets, as this last one, are real artworks. 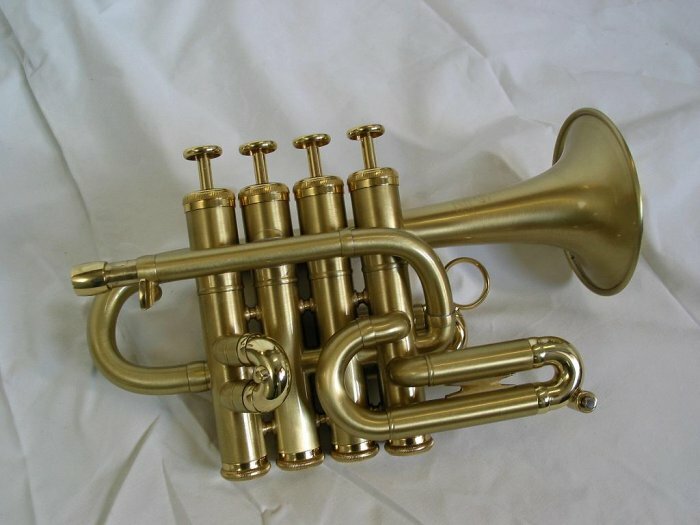 We can find nowadays (mainly on Ebay) many piccolo trumpet models at very low prices. 99.99 % of these models cannot be played, i agree with my friend Jim Donaldson. No 3rd slide tuning system, obviously, and a revolting adjustment. 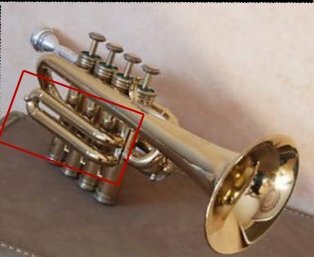 The typical shape of the so-called "Bell"
Despite the beautiful arabesques engraved on the bell, the Helios piccolo trumpet is also model from China...Be careful. Engravings change but the stuff remains the same. See the typical shape of the valves casing and the various elements. No comments...good for decorating your wall. A piccolo without 3rd slide tuning system - ring or trigger - has definitely not been correctly constructed. The same if there is no water key for the 4th slide (you will have to remove the 4th slide in the middle of your concerto). These piccolo trumpets are, to me, useless. The use of Amado keys is the clue that a piccolo was quite hastily designed. On the Chinese or Indian "instruments", the shape of the bell is unique. In a few minutes, you can see the total absence of quality of these industrial so-called instruments. 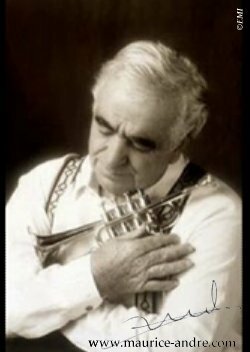 As Jim Donaldson wrote : "Piccolo trumpet playing is difficult on a quality instrument, impossible on a lousy one." Nowadays, many manufacturers buy instruments in Asia and put their brand on them. If you have a low budget, it is therefore much preferable to buy a used handcrafted instrument, even if you need to wait a little to save money. 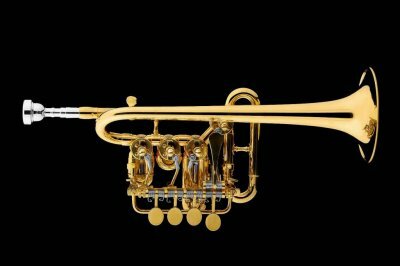 A new trumpet under $500 is a good deal only for who sold it. Do not expect to play anything on this stuff. 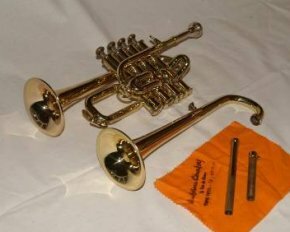 Wait a little, save money, and buy a used piccolo trumpet for +/- $800. This is my advice. The short bell model has a real typical piccolo trumpet sound, its projection is always fantastic. A long bell model will never reach to this impressive sound. The short model is my ideal concept of a piccolo trumpet sound. 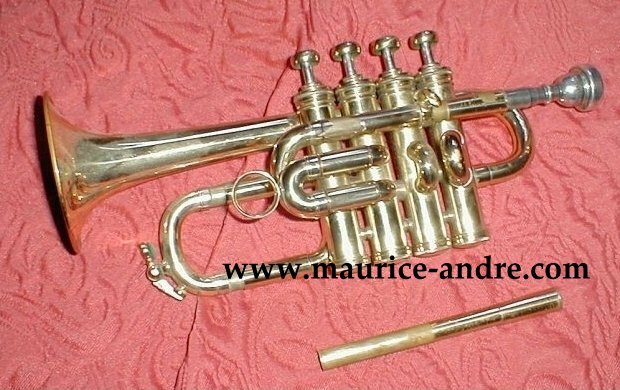 by Maurice André (A piccolo trumpet). A miracle of grace and equilibrium in the writting, an unmatched interpretation.